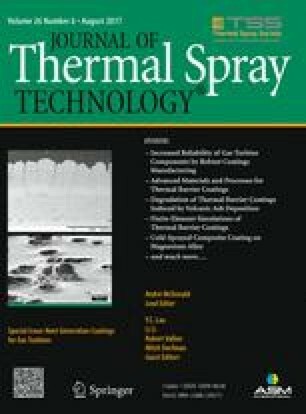 The thermal durability of thermal barrier coatings (TBCs) obtained using feedstock powders with different purity and phase content was investigated by cyclic thermal testing, including the effects on the sintering and phase transformation behaviors. Three kinds of 8 wt.% yttria-stabilized zirconia, namely regular purity (8YSZ), high purity (HP), and no monoclinic phase (nMP), were employed to prepare top coats by atmospheric plasma spraying on a NiCoCrAlY bond coat using a high-velocity oxy-fuel system. Use of 8YSZ, HP, and nMP for plasma spraying affected the microstructure and lifetime of the TBC in furnace cyclic testing (FCT) at 1100 °C and the sintering rate during annealing at 1400 °C for 50, 100, 200, and 400 h. In FCT, the TBC formed from nMP showed the longest durability, while that formed from HP showed lifetime performance similar to that obtained with regular-purity 8YSZ. The TBC obtained with nMP also exhibited the lowest monoclinic phase transition rate, followed by those obtained using HP and 8YSZ. This work was supported by a Korea Institute of Energy Technology Evaluation and Planning (KETEP) grant funded by the Korean Government Ministry of Knowledge Economy (No. 2013101010170C).